urbanscootin.com Honda Metropolitan Scooter Forum • View topic - Say goodbye to froggyness !! Say goodbye to froggyness !! I recently picked up a new helmet , an HJC FS-15. Great helmet ! One of the options on many helmets now (including most HJCs) is what they call a "Pinlock Fog-Free System". It's basically a removable version of the Fog-City type decals , held in place with plastic pins mounted in the helmet's visor , rather than an adhesive like the Fog City. The advantage to this is the fact that you can remove it easily when temperatures are up and fogging isn't an issue, and install it quickly when the cold, wet rides (and the inevitable froggyness) come along. It really works, I've been using this system for awhile now and it's 100% effective . I strongly recommend this Pinlock system to those of you who ride in cold and/or inclement weather . Wipe a little Nikwax Visor Proof on the outside of the shield,install the Pinlock insert on the inside, and you have a helmet that will provide outstanding visibilty in even the toughest wet and cold riding conditions.... no small feat !! BTW , here's a snap of my new lid, I get about 90% positive comments on the paint job , and a few "ughs" ... but I like it, and the graphics are extremely light reflective,and pop HUGE when hit by the sun or headlights..... this helmet is going to stand out big when I'm riding home from work on those dark , rainy winter nights ! The FS-15 ($249) is HJC's top end offering , and compares well with my Shoei RF-1000 in terms of comfort, lightness , and overall quality. Also available in a super lightweight carbon fiber version. This lid is worth a look if you want a high quality , FRP shelled helmet, and don't want to spend $500+ dollars on an Arai or Shoei . And, it comes standard with a pinlock equipped shield , all you have to do is buy the pinlock insert ($29) . Re: Say goodbye to froggyness !! Nice lookin' helmet! I'll have to look into that; its time for a new one (last time mine was replaced was 8 yrs ago) and I think this will be a consideration. Can the pinlock shield be retrofitted to older HJC helmets? Anti-ugh! Looks wicked cool to me. Glad you have no fog, either. All good! Paddy_Crow wrote: Can the pinlock shield be retrofitted to older HJC helmets? If your HJC uses the HJ-09 series shield , you can buy a replacement shield with the pinlock pins already installed . They also offer a retrofit kit , which involves using a template to drill holes in your existing shield to mount the pins. This would be the way to go if you didn't want to buy a new shield, or if your helmet doesn't use the HJ-09 series shield. Like I said, some folks like it, some don't . 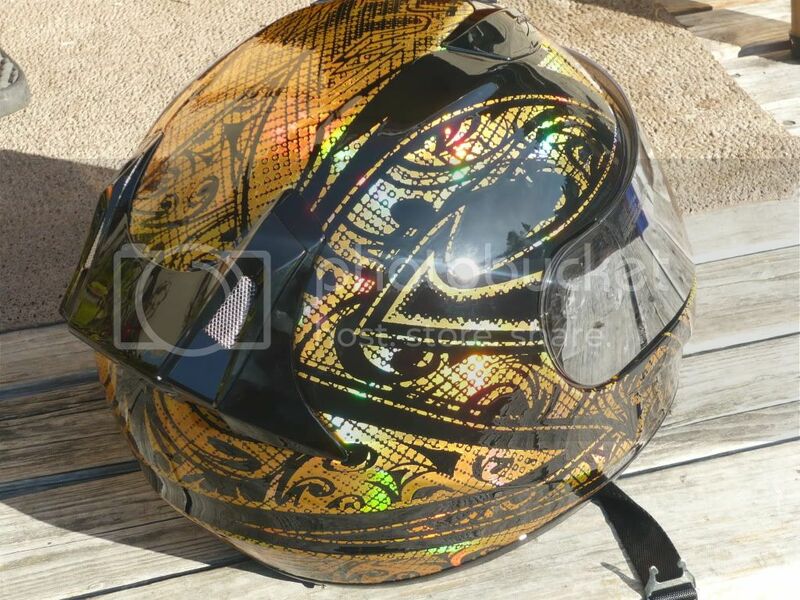 I've always been inclined to wear low key lids without graphics, but I really liked this one just due to the fact that its a giant reflector ..... anything I can do to be seen and noticed on the road , especially since I ride in some pretty low visibility situations . GizmoGal wrote: Anti-ugh! Looks wicked cool to me. Glad you have no fog, either. All good! I believe my helmet does use the HJ-09 shield, at least it's listed among the helmets that the shield fits (mine is the CL-Max modular shield). I'm going to be needing a new shield before long, I'll make sure to get the one with pins. Oops, now I find that mine takes the HJ-07 shield. But it also appears to come with the pins. So I came home yesterday, sat on my couch, and found a sheet printed up by my wife on simple household cleaning tricks. One of them listed addressed the problem of fogging up the bathroom mirror while taking a shower. It said to use shaving cream to clean it, an you'll never see fog again. I thought that was interesting, then a light went on in my head (doesn't happen very often): I wonder if this would work for my FF helmet visor. To make a long story short, it did work. I cleaned it this morning with shaving cream, and rode to work on a typical Virginia spring morning with plenty of moisture in the air. A typical morning where I would have to crack my visor open to clear out the fog. There was nothing, not even at stop lights where I sat there and waited. I didn't even have to crack the visor open. I was amazed. So little trick to get ride of fog problems without having to purchase the pinlock system: clean the inside of your visor with shaving cream. Granted, I don't know how long this effect will last for, nor do I know the range of weather circumstances it can handle. It might end up only being useful for mornings like today, but it worked. Well, I am all for handy tips and tricks that are cheap and effective ! What brand of shaving cream did you use ? Most of the ones out there contain alcohol, butane ,propane and stearic acid....any or all of which could degrade your plastic face shield , either instantly or over time. Not so much , your glass bathroom mirror . Most helmet manufacturers advise you to avoid chemicals and solvents of any kind on those visors, and I wholeheartedly agree , having seen many, many visors blown up by various glass cleaners and whatever spray-on stuff people decided to clean them with. I personally killed a brand new one years ago with good 'ol Windex.....it instantly got rainbow-vision , which sounds cool but really kinda sucked, lol. Rain-X is another one that takes out a lot of visors , again a product designed for glass but harsh on plastics. The subject becomes more complicated by the fact that not all visors are the same, so what is harmless on one might degrade another in seconds. Cleaning: HJC does not recommend cleaning any shield with spray on type chemical cleaners. A reaction between shield and cleaning chemical is possible, resulting in haze build-up and distortion. HJC recommends washing the shield with warm water and soft cloth only. I use my eyeglass cleaner. It's a very mild detergent and it's designed for plastic lenses. Does a great job. Another thing I love about a flip up helmet. When it fogs, I just flip it up. as soon as I'm moving again, I flip it back down. Plexus is another spray-on cleaner designed for plastics , and is generally safe for use on helmet visors. I've found that warm water , with maybe a drop of mild liquid hand soap , does the job just fine. old thread, but i just wanted to add i love the pinlock system. main reason i got the nolan n90 was it came with the pinlock shield/insert. i can see the edges, not covered by the pinlock fog when i exhale in cold weather but the insert stays clear -- awesome!